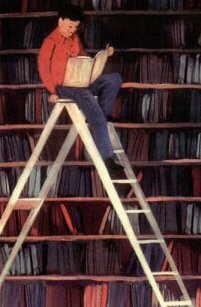 Joanne's Page for ESL Teachers: Tips:Trip to the Library. All three phases are used in the following instructions. to the English version, but don't hand out until the exercise is completed! Pass out the maps of the city to the students. This is a good time to review some of the places visited from the Directions Lesson. Locate the library on the map. Ask the name of the street where the library is located. Ask if any of them have been to the library? Do any of them have library cards? Model Conversation #1 several times. After working with the whole class as a group, use it as a chain drill, each student asking another. Tomorrow I will go to the library. Yesterday I went to the library. Use the verb "To Look For"
Show the prepared map of the library. Go over the main sections of your library, showing the checkout counter, video section if you have one, and the children's section. Show them the information paper of programs for children. Explain the storytime. (If you have beginning students, you might pantomime this one.) Point out the date and time of the story hours. Use the verbs "To See" and "To Read"
Put up the enlarged version (an overhead transparency or large piece of paper). Hand out an application to each student. Demonstrate how to fill in the first line, by placing your name there. Then erase it and have a student come up and put their name on the large sample. Continue, having each student come up until the form is completed. After filling out the application in class, give the application to them in their own language, if available. If not, see if you can arrange a translator to be there to explain the responsibilities of checking out and caring for books as explained on the application.